Vera Maxine Broughton of Irving passed away on February 3, 2019 surrounded by her loved ones. She was born on October 25, 1929 in Gardena, California to Roscoe Durrington and Jewel (Carter) Durrington. Vera’s top priorities were her faith, family, and friends. 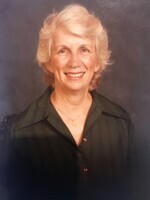 She worked as an assistant physical therapist, and was a talented musician who played the piano, organ, and accordion. She loved the beach, mountains and any kind of travel. She was very active in her church and hosted weekly bible studies, gave rides to those in need and enjoyed reading to school children. She will be remembered as a loving mother, and grandmother and for her fearless approach to life in addition to her great sense of humor. She is preceded in death by her parents; husband Howard Anthony Broughton who she met square dancing in 1972; and sisters Irene and Loise. Left to cherish her memory are daughters Sandra Goldstein, Cynthia Smith; son Russell New and wife Valda; as well as many other extended family and loving friends. Funeral services will be held at 2:00 pm on Monday, February 11, 2019 at Conejo Mountain Funeral Home Chapel in Camarillo, California. Memorial donations may be made to the Alzheimer’s Association by visiting our web site at www.brownmem.com.